Every week, I wince at the cost when I go through the grocery store checkout line. How can I save money but still eat healthfully? Shop the sales. Look at grocery store fliers to see what’s being offered at a discount. They are often available online in advance to help you plan. Shop on a full stomach. It’s true: You’ll tend to spend less than if you shop when you’re hungry. Plan your meals based on sale items or items you already have on hand. Make a list according to your meal plan, and stick to the list when you shop — unless you see a cheaper alternative while you’re at the store. These days you may find bargain prices on some items in the fresh produce aisle, but don’t forget frozen and canned fruits and vegetables. They are generally cheaper than buying fresh and have comparable nutrients. Try to incorporate more of these items in your meal planning. Bypass convenience foods, such as preseasoned chicken breast and boxed or frozen dinners. Not only do you pay extra for them, but you can control the amount of salt and fat in foods when you prepare them yourself. Check low and high shelves as you walk down the aisles: Often, that’s where you’ll find bargains. Examine unit prices and check if there are lower-cost alternatives. Unit prices — the price per ounce, per pound or other unit — are often listed on the price tag on the store shelf. If not, you can do a quick calculation yourself by taking the price of the product and dividing it by the weight. Larger packages and store brands are normally cheaper than smaller packages and name brands, but not always, especially if there’s a sale or if you have a coupon. That said, use coupons only when they make sense. Always check to see if you could save even more money by buying a store brand instead. When you see an item that you often purchase offered at a significant discount, take advantage and stock up if it’s something that can be stored or frozen for later use. 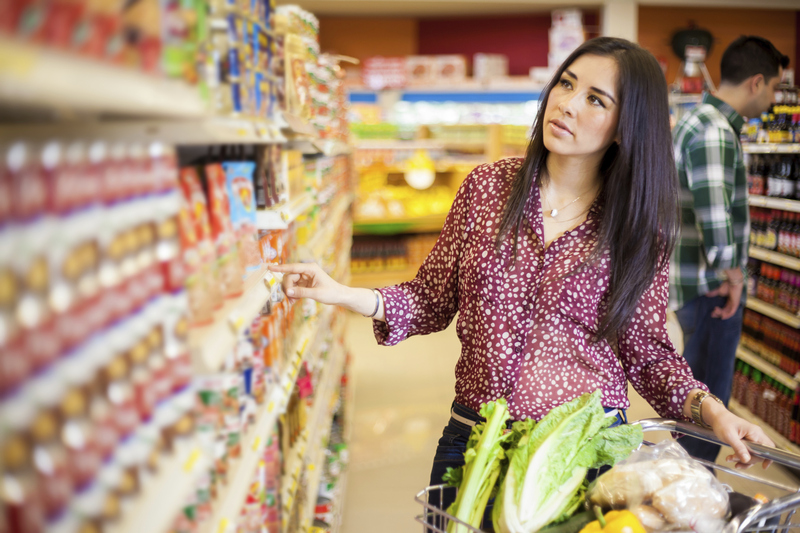 Buying nonfood items at the grocery store can increase costs dramatically. See if you can buy them more cheaply at discount stores. Need more ideas? Iowa State University Extension’s SpendSmart EatSmart website offers plenty:www.extension.iastate.edu/foodsavings/. Or, see ideas from the U.S. Department of Agriculture’s Supplemental Nutrition Assistance Program at bit.ly/snapbudget. Editor: This column was reviewed by Irene Hatsu, state specialist in food security for Ohio State University Extension, the outreach arm of the College of Food, Agricultural, and Environmental Sciences. Posted in Saving Money	Tagged budget shopping, eating better, saving money	Bookmark the permalink.